Tel Tac II Tachometer rugged construction allows it to perform in almost any racing environment. PIt Stop USA is The Online Motorsports Superstore! The Tel Tac II Tachometer is a self-contained digital tach with built-in memory recall. Compact 3-1/8" x 3-1/8" size is easy to mount. Extremely rugged construction allows it to perform in almost any racing environment. Tel Tac II recals and displays the highest overall RPM for up to 30 minutes after the car is shut off. 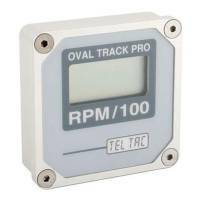 Tel Tac Oval Track Pro shows the highest overall RPM, the four lowest RPMs and the four highest RPMs from two laps. This allows you to tune your car correctly, not guess. Powered by common 9 volt battery. The tach works on 4, 6 & 8 cylinder engines with either magnetos or distributors. We feature Tel Tac Digital Tachs at low everyday prices.